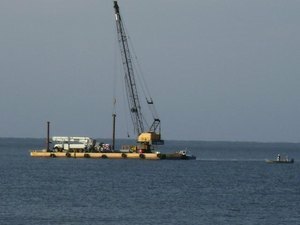 Those Progress Energy folks are working fast here on St. George Island. 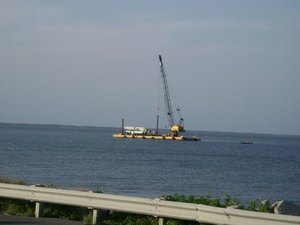 This barge was out in the bay Friday afternoon late - note the truck on the barge, which you can see better in the close-up. They were out working full strength to get the poles reset and get us back on permanent power. And, the word is that we will be coming back online with permanent power over the newly set poles tonight! They are telling us to expect the power to be out for 2 hours or so, sometime between 10PM and 6AM, as they shift the power supply back to the lines and off the generators, one section of the island at a time. Hats off to our infrastructure talent - pretty amazing that they can run an entire island off generators, very efficiently, and also restring main power lines that quickly. The weather took a lovely turn for the better today - lower humidity, and about 10 degrees cooler than it has been. I was particularly thankful, because I had three turtle nests to evaluate this morning that had hatched out sometime during all the rains we had this past week. It was quick work, digging in damp sand rather than loose as a goose sand that fills the hole in at half the speed you are digging it. The beach was very peaceful at dawn, and still has that clean swept look from all the wind and rain earlier in the week. 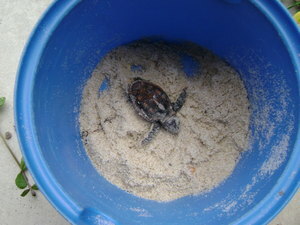 I found one baby turtle still in one of the nests, actually still half in his eggshell. He finished crawling out of his eggshell while I was processing the rest of the nest. I brought him home in my trusty blue bucket for a little quiet rest, and will release him after dark tonight. All three nests were good strong hatchouts, with over 105 eggs hatched in each of the three nests, and no more than handful of unhatched eggs in each. I hope all the babies found their way to the stormy waters and out into the gulf successfully!